With a seasonal outdoor pool and free Wi-Fi the Bluegrass Inn is a smart economy option for stays near Kentucky State University. 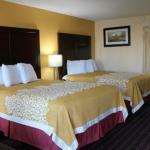 The two-story Bluegrass Inn offers 61 exterior-access rooms with cable TVs microwaves mini-fridges and coffeemakers. Guests stay connected with the folks back home thanks to free Wi-Fi throughout the hotel. Additional perks include a 24-hour front desk free parking and a business center with fax and copy services. Non-smoking rooms are available and pets are welcome for an additional fee. The Bluegrass Inn is off I-64 five minutes from Kentucky State University and 10 minutes from the Kentucky State Capitol and the Governor's Mansion in downtown Frankfort. Within a 10-minute drive guests can see the famous Floral Clock or visit Daniel Boone's Grave in the Frankfort cemetery. The Buffalo Trace Distillery part of the Kentucky Bourbon Trail is six minutes away. The Bluegrass Inn is about 19 miles from Blue Grass Airport in Lexington.